Whenever new firmware updates are available, you'll see the following on the Microbot App. 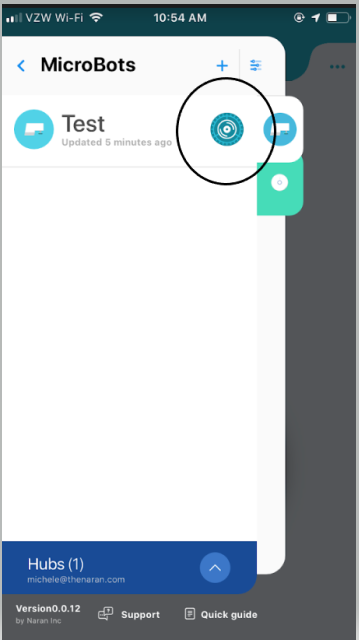 In the left sidebar, when you view the list of paired MicroBots, the icon below is shown. To update the firmware, tap on the icon and wait until the update is completed. Once completed, the update icon disappears. Another place to update firmware is in the right bar settings. Scroll down to the bottom, where you can see the firmware version you have, as well as the latest available. If an update is available, select "Upgrade Firmware", and wait until the update is completed. Once completed, the update icon disappears. PLEASE NOTE! Make sure you stay connected to your Microbot during the update and do not exit the app while the update is processing. 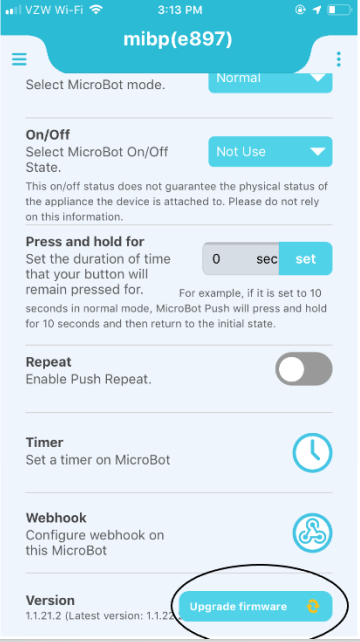 When updating firmware for the Microbot Alert, please also connect your device to a power source using a micro USB cable. The Microbot Push does not need to be connected to a power source, however please ensure the device has sufficient battery to successfully complete the update.